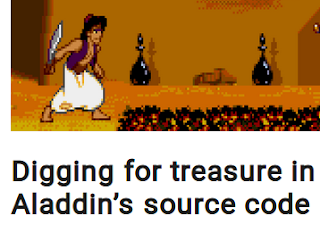 They made a wonderful job at gamehistory.org, based on an in-depth analysis of the sources of the Mega-drive game "Aladdin". 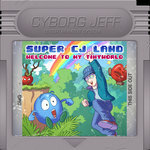 The game was made by David Perry's team who also brought us Cool Spot. 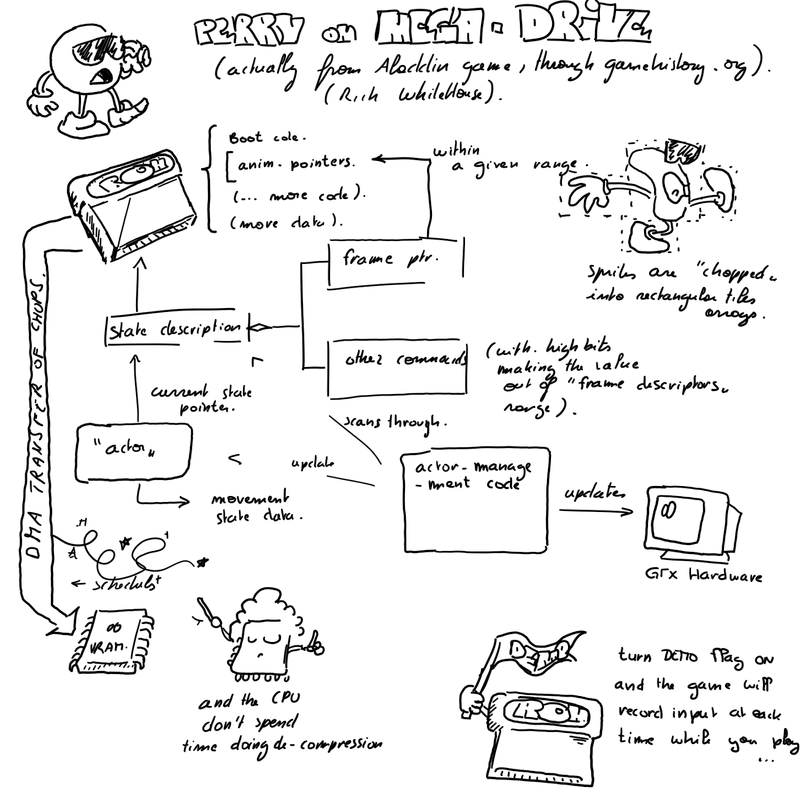 At the core of their work is a technique and a toolset to allow more flexibility in animating graphics on 16-bits system that had read/write video memory on-board (as opposed to NES with read-only video memory alone, on the cartridge) and fixed-size sprites (e.g. 16x16, 16x32, 32x32). Everything else will seem silly to you if you do not accept that, by then, getting more KB of memory for your game was very - very - hard. The size of your game was decided by non-technical people based on how much the console vendor would charge for a 2Mbit chip, when the game should came out and how much kids would be allowed to spend given which license you'd be using. 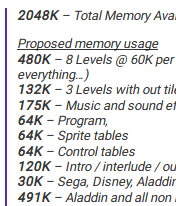 So they have early planning deciding how much to dedicate to sprites, levels, code, maps, etc. Based on that, they'll decide how much levels there will be in the game, etc. Of course, game characters animation all started by having characters whose size fit the hardware requirements (mario nicely stands within a 16x16 box and a 16x16 mushroom makes him 16x32), flipping from one sprite to another within an all-in-VRAM bank. Then some special characters (the hero) would get a special status and only get one or two VRAM slots dynamically updated. To crunch more animation frames, one could use run-length-encoding compression that does wonders on row of pixels of identical color. Others have used 2/3-bit-to-4-bit decompression once realizing that Link sprite (and all others) only need 8 colors per palette, not 16. But all this requires CPU, and the CPU resources too, were limited (Not even 8MHz. Less than my good old 80386). To make that possible with fun stretch-and-squash, cartoon-like animation, they ultimately relied on their chopper tool that cuts pictures into hardware-sized sprites. Just like the one I imagined for Titus's Prehistorik II sprites. Ok, granted, it doesn't look completely automated. But the idea is clearly there. 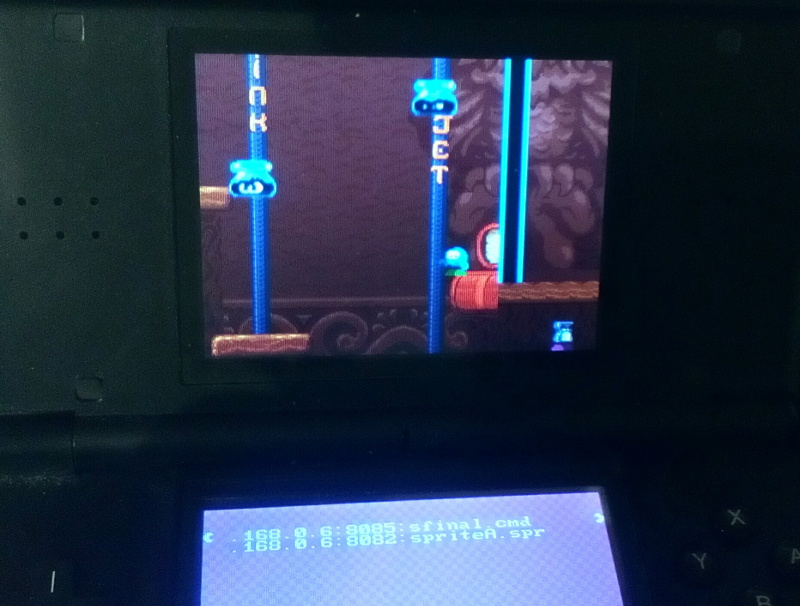 And ultimately, it would run on a system that has 1/4 of the power of my Nintendo DS. So, am I allowed to dream of porting some libgeds game on 16-bit engines ? 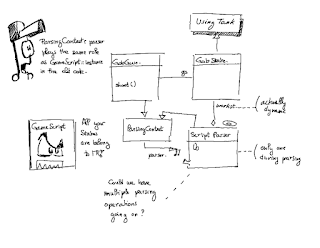 Well, with the engine refactoring that splits script parsing, it is pretty tempting to see what we could do about it. Let's start with the animations, thus. 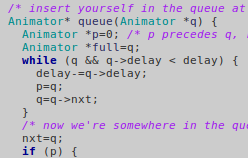 What is weird with the animations is that their code has to interrupt every here and there when there is some delay. In high-level language, we'd likely use a switch construct branching you to frame T or frame T+1 code depending on some argument we'd pass to the function. But if we're generating machine code instead, we can do much better. We can then have the actual next animation instruction remembered, rather than an index into an array of virtual instructions. No more conditionals and branch delays on that non-speculating old CPU. Just one jump. Implementing "keep that state for N screen refreshes" is then looking a lot like software multi-threading: you have a call to some yield_animation micro-routine (and saving your current position into the generated animation code on the stack), which will pop that resume position into some CPU register (an internal scratch variable, in case you didn't know yet), and then return to the code that called animate_aladdin, letting it save the next animation position where it sees fit. Looping animation ? super-easy ! Have you seen how much boilerplate the current virtual-RISC-processor-for-animations of libgeds and AnimEDS must deal with instead ? What else ? 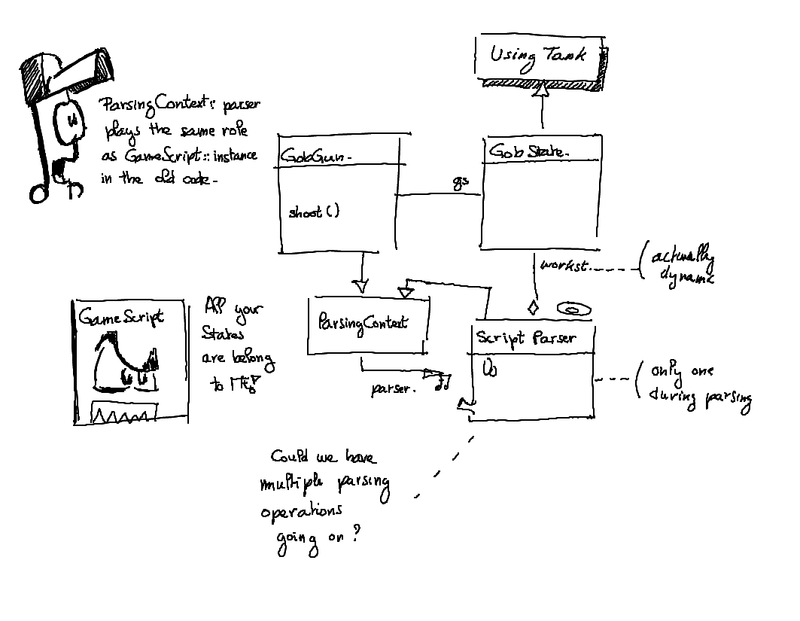 State machine of course. 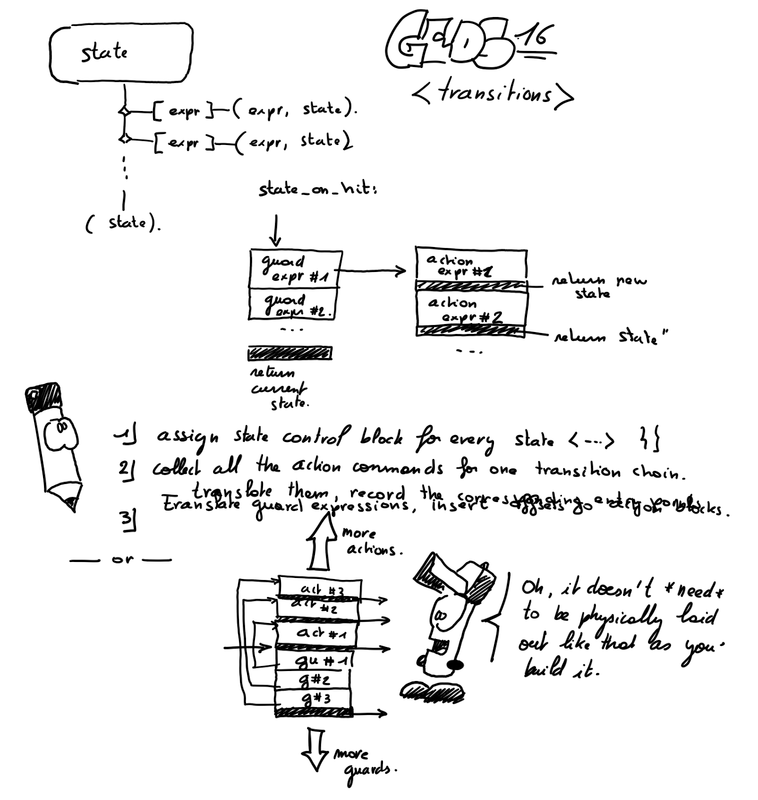 State machines are built with simple expressions used either to guard transition (only let them used when some condition is met) or to define what to do when the transition occur (besides changing states, that is, like playing a sound, changing speed, etc). The collision system currently will follow a list of GobExpressions calling eval(guard_predicate) until one returns true, then proceeding with eval(action) and changing state. 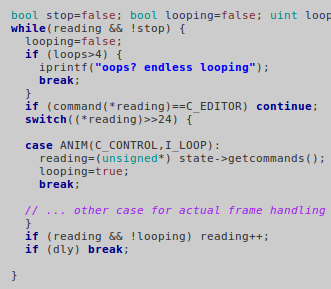 Instead, with generated machine code, that would all be packed into a sequence of predicate code that branch to the appropriate action code or keep testing until we hit the "okay, then nothing happens" terminator that returns to the collision system itself. One day ... maybe. 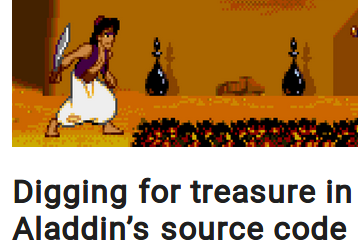 That would be much more interesting on 16-bit than it would be on DS or native x86_64 code, anyway. For me, at least. 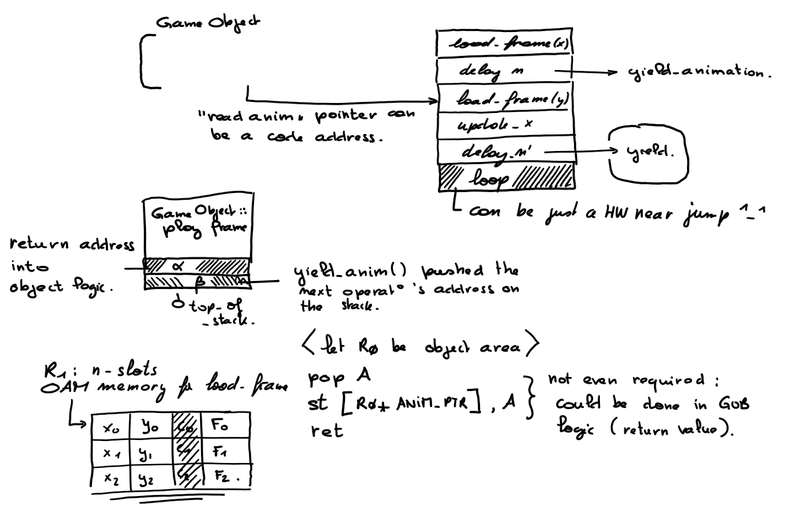 I wanted to make the scripts occur as soon as possible in my tutorial series, since the GEDS engine is meant to allow game-making even for those who don't know about C++ programming. 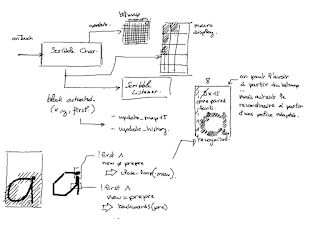 But I also want to be able to introduce a behaviour editor, which suggests that the same script-parsing logic should be able to drive either the game engine or the state machine model in the editor. So this last week, I've been busy splitting the big singleton "GameScript" that had both the parsing logic and the engine intimacy into two classes, the ScriptParser that knows the language rules and the Game* objects well enough to create them but has no knowledge about the Nintendo DS resources or the game engine per se, and the GameScript, that knows about the engine's runtime, last as long as the level does, hold resources and the like. I've finally reached a point where all my automated tests work again. Of course, School Rush isn't running fine in this branch ... yet. edit: Okay, SchoolRush runs fine again in the emulator. Just some un-initialized arrays. -Weffc++ should have caught that, though. 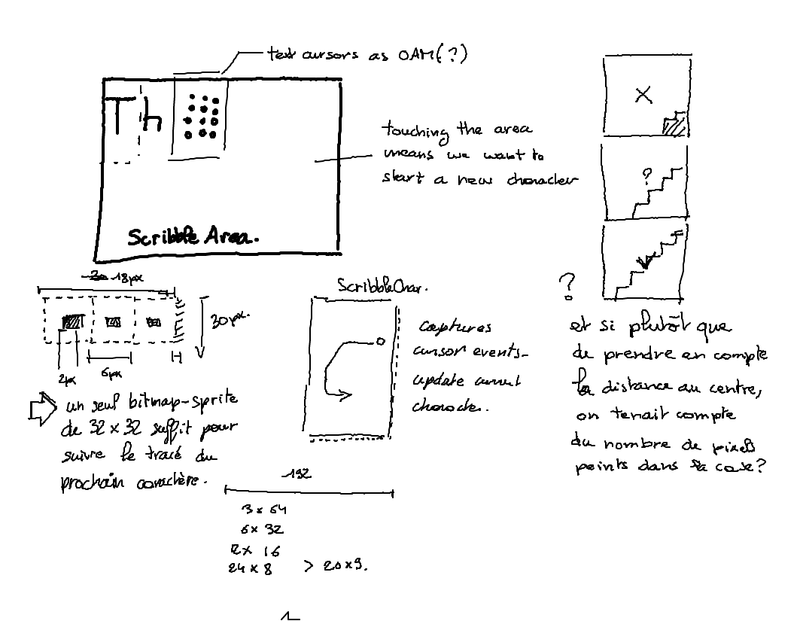 quelques petits essais (dans SEDS) de ce que donnerait un système de reconnaissance d'écriture avec soit 8 pixels ou 6 pixels par "cellule". Je préfère 6. La police 8x15 juste à côté servirait pour les caractères reconnus (une fois le tracé terminé). Je pensais réécrire une partie du système d'animation. Il est inspiré d'un gestionnaire d'évènement à retardements pour systèmes d'exploitations. 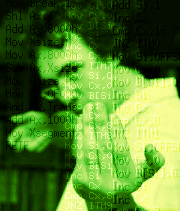 Sauf que dans le cas des sprites dans libgeds, à peu près tout est exécuté à chaque image. Ne serait-ce que parce qu'il me faut compenser les mouvements de la caméra. I had somehow convinced myself that the animation scheduler system of libgeds needed a rewrite, that scanning through the list of animators to push new content in the middle everytime some new object was shot was a mistake, and that everything would work better, faster and stronger if I had a list of 'play every frame" in addition to the current list of "play when delay expires". But actually, the insertion policy is somewhat different: we insert _before_ any item that has the same delay, therefore making most in-game insertion as trivial as 'insert at the head of the list'. 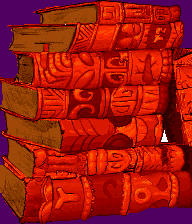 Je craignais qu'il y ait régulièrement des éléments qui doivent inutilement être placés en bout de file d'attente parce qu'il y a de nombreux autres sprites à animer, et tous avec le même délai. Mais en fait, il n'y a pas besoin de modification. A cause d'un tout petit détail dans sa définition "place a après tous les animés qui ont un délai strictement inférieur". Donc tous les éléments qui ont le délai minimum (les objets et personnages du jeu) seront placés en tête de liste, temps d'exécution minimum aussi. 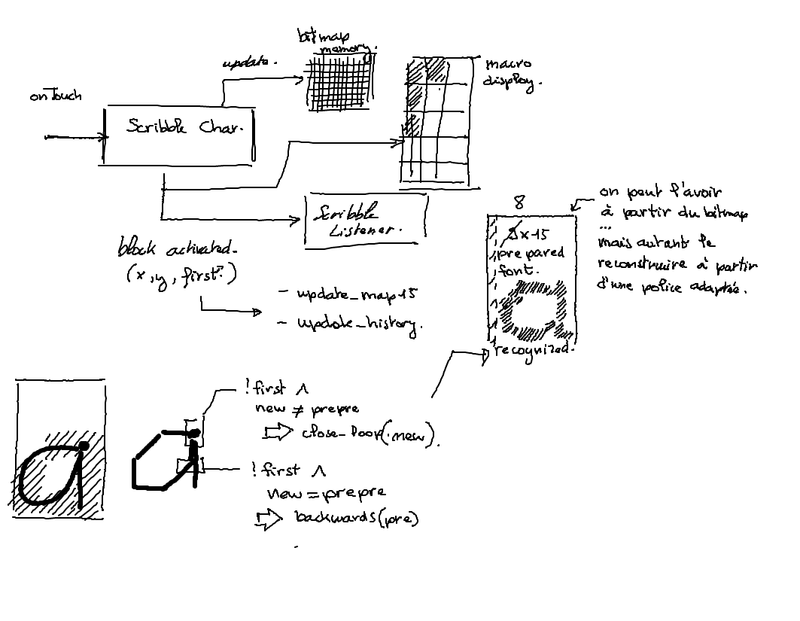 I have just started a github with one branch of the dsgametools project: the 'tutorials' branch, where I'm reconstructing and detailing step by step the components of the (refactored) game engine... together with Creative-Commons pictures and sounds to make demos on a regular basis. Additional chatting and promotion of the tutorials happen in gbatemp and e-magination forums. Cette fois-ci ça y est. J'ai transféré la branche "un tutoriel après l'autre" sur github. Pour que chacun puisse facilement suivre ma tentative de réécrire le moteur des jeux Bilou. Histoire que les différentes fonctions disponibles soient capturées clairement, et non pas éparpillées sur une demi-douzaine de patches. Allez, je me suis bricolé une dernière map pour School Rush: la récompense pour ceux qui seront parvenus à grimper jusqu'en haut du "niveau secret". Il y aura une présentation des monstres, bien sûr, mais aussi une petite surprise qui m'a pris du temps à mettre au point. Au niveau de l'idée, je veux dire. I sketched up a last map for School Rush, that will be the final reward to players who beat the secret climbing challenge. It took me some time to nail down the idea I wanted to have, but I think all I have to do now is some pixels and some scripting. 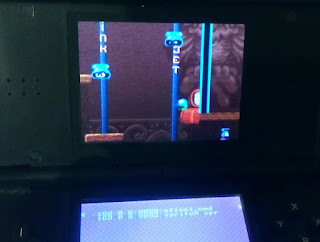 And making sure I can restrict the part of the level that the camera can show. I'll have to keep the todo list off-line, though so that you have a real surprise ;-). edit: since many of the monsters' behaviour is slightly different here, how about #ifdef LAST_MAP in the .cmd files that can lead to e.g. inkjet.cmd vs. inkjet_last.cmd ? Perdu dans un petit coin d'un driver Linux, une fonction sympa qui augmente un des verrous avec un chronomètre ... histoire de voir combien de temps on est resté en section critique. 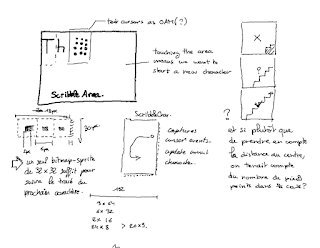 Je devrais peut-être bien ajouter quelque-chose de ce genre avec parseLine() dans GameScript, tiens. Et capturer le numéro de ligne des transitions crées, ce ne serait pas mal non plus.